The OSUCCC – James is dedicated to transforming the latest discoveries into effective minimally invasive treatments for patients with head and neck cancers. As a leader in the field of translational research and groundbreaking therapies, Ohio State successfully pioneered robotic-assisted head and neck surgery on cancerous tumors and benign lesions. Our multidisciplinary team, equipped with unmatched robotic experience, is paving the road for excellent patient outcomes and improved quality of life. Robotic surgery is a technological breakthrough that is replacing traditional open surgery as the standard approach for head and neck surgeries. Led by Enver Ozer, MD, one of Ohio’s most experienced robotic head and neck surgeons, our team of surgeons performs minimally invasive robotic surgeries on the tonsils, base of the tongue, voice box, skull base and thyroid. Using revolutionary robotic procedures, Ohio State is leading the way in setting new standards for head and neck surgeries. Ohio State is one of only a few institutions performing transoral robotic surgery (TORS), an alternative to chemoradiotherapy and traditional open surgery for patients with head and neck cancer. TORS is a minimally invasive surgery that eliminates the need for open surgery’s long incisions through the throat and jaw, which often leave patients with visible scars, difficulty breathing or swallowing following surgery and a lengthy recovery. The revolutionary procedure involves a small hidden incision in the armpit that allows the surgeon to make a tunnel under the skin to the thyroid area. The surgeon removes the diseased thyroid through the tunnel. Patients are typically discharged from the hospital in one to three days. Ohio State is in an elite group of only 35 medical centers nationwide offering robotic thyroidectomies and the first in Ohio to perform robotic thyroidectomies. Surgeons at Ohio State collaborate across disciplines using a revolutionary approach to reach and remove skull base tumors. Internationally known endoscopic surgeons, Ricardo Carrau, MD, professor of otolaryngology and director of the department's cranial base surgery program, and Daniel Prevedello, MD, associate professor of neurological surgery and director of Ohio State's minimally invasive cranial surgery program, pioneered an endoscopic endonasal procedure that removes skull-based tumors through the nose. Surgeons work through both nostrils using an endoscope, and through the mouth with robotic­ assisted instruments, to gain access to the base of the skull, intracranial cavity and top of the spine. Ohio State is one of only 10 centers in the country providing comprehensive care for skull base tumors. Patients have ready access to the core members of their team at one location, including their head and neck surgeon, neurosurgeon, reconstructive surgeon and nurse practitioners, as well as endocrinologists, ophthalmologists, speech and swallowing therapists and prosthetic experts, if needed. Enver Ozer, MD, Associate Clinical Professor highlights the importance of using robotics for head and neck surgeries. 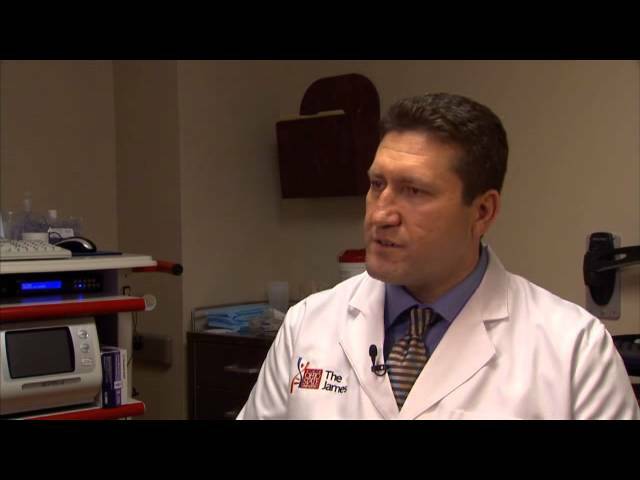 Ricardo Carrau, MD, Director of the Cranial Base Surgery Program describes the state-of-the-art technology used to remove skull-based tumors through the nose. After suffering a persistent cough and a constant feeling of phlegm in her throat, Jan learned she had tonsil cancer. Today, Jan is cancer-free, thanks to the OSUCCC-James' Dr. Enver Ozer.